Reading: A Journey © 2005 City of Philadelphia Mural Arts Program / Donald Gensler. Used by permission. The Ethnography in Education Research Forum at the University of Pennsylvania Graduate School of Education invites submissions for its 2019 Annual Meeting and the celebration of the Forum's 40th anniversary. The Forum welcomes scholars at all career stages seeking a supportive venue for sharing their ethnographic work at various stages of development. The Ethnography Forum is internationally recognized for its encouragement of original and in-depth ethnographic research on education broadly defined, within and outside the context of schooling. The Forum provides a space for ethnographers in a range of disciplines and fields to come together across generations to share and learn from each other and, in so doing, to become part of a broader intellectual community. Coordinated by current and former graduate students in collaboration with faculty members, the Forum is committed to advancing systematic, rigorous, and engaged inquiry and to involving students in all phases of the meeting. Submissions are no longer being accepted for review. Advance Registration has opened. Information about our program and special guest speakers are available on our 2019 Program Site. In 2019, the University of Pennsylvania Graduate School of Education and the Center for Urban Ethnography will celebrate the 40th anniversary of the Ethnography in Education Research Forum, one of the most longstanding and renowned scholarly venues for this intellectual tradition. This year’s theme, “The Future of Ethnography and Education: Methodologies, Equity, and Ethics”, is intended to reflect the breadth and depth of ethnographic research and scholarship that have emerged over time and to anticipate future directions for the field. The present is a particularly important moment to interrogate the role of educational ethnography, as issues of equity become increasingly precarious in the U.S. and globally. We invite participants to revisit the fundamental goals of ethnography and its potential to address pressing issues of educational access, teaching, and learning in multiple contexts and alongside diverse communities. We encourage submissions that represent the wide range of research settings and topics (e.g., schools, homes, communities, literacy, language, immigrant students, gender, race, and class) and that create opportunities for critical discourses examining the history, contributions, and possibilities for how we study and gain access to, and engage with communities, and how we use knowledge to promote justice and the public good. In what ways does ethnography represent a unique methodological framing and/or how does it interface with other approaches such as practitioner inquiry, community-based research, and participatory action research? What does the practice of ethnography tell us about the cultural domains of our work and the potential to effect change, particularly in the face of historic and current inequities? How does knowledge gained from ethnographic research shape theory, policy, and practice, and how might it better advance educational equity? How do we strategically use the close read of cultural communities that ethnography provides in ways that inform efforts to reduce inequality, poverty, and discrimination? What are the ethical questions that we should address in the next generations of ethnographic research? We welcome research submissions that push the field’s thinking about approaches that enhance how we interpret the role of ethnography, how we partner with communities, and the methodological and ethical limits and dilemmas inherent to its use in theory and practice and for the range of people and communities we study. Plenary and Keynote Speakers 2019 include Drs. Stacy Lee, Roberto Gonzalez, Na'ila Suad Nasir, Tarajean Yazzie-Mintz. More details can be found on our 2019 program site. Volunteers: Penn Students may volunteer here. Advance Registration: Open November 1, 2018 to February 10, 2019. Click here to register. Outstanding Book Award, 2019: Submissions for the new book award should be received by September 15, 2018. See more below. Keep updated: Join our mailing list. Call for Papers: July 1, 2018. Paper Submissions open: August 22 2018. Participants may begin to upload their proposals for papers and session. The submission portal can be found here. Book Award Deadline: September 15, 2018. Submissions for the inaugural 2019 Outstanding Book Award must be received by this date in order to be considered. Submissions close: October 18, 2018. Proposals for papers and sessions are not accepted beyond this date. Proposal decisions: November 15, 2018. Decisions are expected to be released to those who submitted. Advance registration opens: November 1, 2018. Attendees may now register for the 2019 conference. Advance registration deadline for presenters: December 15, 2018. Those who are presenting and appear in the program should register by this date. Sneak Preview of Program: December 15, 2018. An early preview of the program should be available. Hotel Rates are guaranteed through: January 20, 2019. Attendees who make reserveations after this date may not be able to obtain special conference rates. Program available: January 30, 2019. The final program should be available. Advance registration closes: February 10, 2019. Beyond this date, attendees should plan on onsite registration during the conference. Conference Dates with onsite registration: February 22-23, 2019. Outstanding Book Award 2019 recipient announced: February 22-23. The Ethnography in Education Research Forum is delighted to annouce the first Outstanding Ethnography in Education Book Award. The award has been established to acknowledge and honor a recent, book-length, academic publication, published in the past three years, that draws on ethnographic inquiry into education, broadly defined. A committee of scholars will evaluate submissions based upon three criteria: (a) rigor and innovative use of ethnographic methods; (b) contribution and depth of scholarship; and (c) potential for transformative impact on future educational research or practice. Copies of the book, entry form, CV, and letter of nomination should be received by September 15, 2018, and the first recipient of the award will be announced at the 40th annual meeting in February. 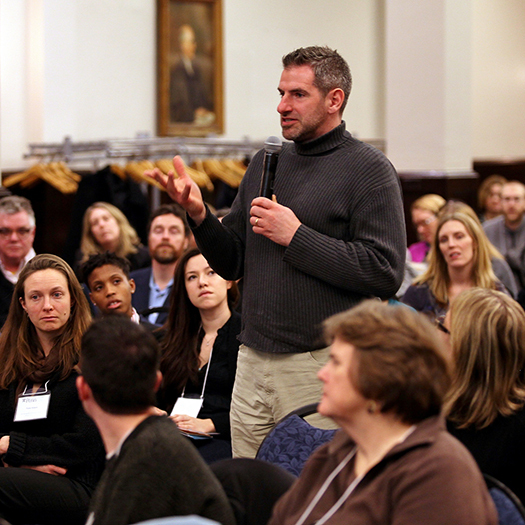 The Ethnography in Education Research Forum, convened by the Center for Urban Ethnography at the University of Pennsylvania Graduate School of Education (Penn GSE) every year since 1980, is the largest annual meeting of qualitative researchers in education. The Forum excels in nurturing ethnographic research and researchers in schools. The Forum is known for its friendly and supportive atmosphere for fledgling researchers and for the spirit of relaxed and open dialogue embracing newcomers and experienced researchers alike. Areas of emphasis include: multicultural issues in education, practitioner/teacher/action research, critical and feminist ethnography, ethnographic evaluation in education, language issues in education, uses of ethnography in math and science, and indigenous language revitalization. Marilyn Cochran-Smith and Susan L. Lytle –both assistant professors at Penn GSE at the time – initiated practitioner Inquiry Day in 1987 in response to the burgeoning U.S. and international interest in teacher research, action research, critical action research, and participatory research. From the beginning, the intent of Practitioner Inquiry Day was to provide a space for educators to share their research in various formats, including papers, symposia, data sessions, informal group discussions, and more.